Help your child adore Jesus with 12 fun, easy to learn scripture memory songs. 'Adore Him' will teach your children more about the character of our Savior through these songs that symbolize the many names of Jesus in scripture. 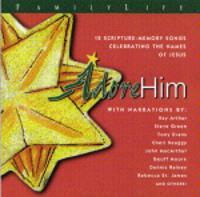 Includes narrations by: Kay Arthur, Steve Green, Tony Evans, Cheri Keaggy, John MacArthur, Geoff Moore, Dennis Rainey, Rebecca St. James and other!